In people, loss-of-function mutations in the voltage-gated sodium channel Nav1.7 result in total insensitivity to pain. Replicating that absolute loss of pain perception in animals has proven a challenge—globally knocking out Nav1.7 in mice is lethal, and targeted deletion of the channel in a subset of sensory neurons results in only partial deficits in pain sensation. Now, a team led by John Wood, University College London, UK, reports that rendering mice impervious to most types of pain requires deleting Nav1.7 not only in sensory neurons, but also in sympathetic neurons. In particular, removing the channel from both cell types protected the animals from neuropathic pain. The mice give the field a much-needed animal model for dissecting the biology of Nav1.7 in pain, and may shed light on how to better target the channel therapeutically. In an immediate illustration of that idea, Wood and collaborators used the mice to uncover a novel role for Nav1.7 in neurotransmitter release in the spinal cord. The study appeared online April 24 in Nature Communications. “This is an elegant study that provides a boost to the field,” said Sulayman Dib-Hajj, Yale University School of Medicine, New Haven, Connecticut, US, and the Veterans Affairs Medical Center, West Haven, Connecticut, US. Dib-Hajj, whose recent work has implicated Nav1.7 in the painful disorders inherited erythromelalgia and small fiber neuropathy (see PRF related news story; Dib-Hajj et al., 2010; Han et al., 2012), was not involved in the new study. Nav1.7, encoded by the gene SCN9A, is required for the initiation of action potentials in sensory neurons. In humans, loss-of-function mutations produce congenital insensitivity to pain (CIP; see Cox et al., 2006). To create a mouse model of Nav1.7 deficiency, the Wood lab previously produced a knockout targeted to sensory neurons that express the related channel Nav1.8. Those mice showed diminished pain response to mechanical insults and deficits in inflammatory pain, but had normal responses to acute thermal stimuli and nerve injury (Nassar et al., 2004; Nassar et al., 2005). In the new study, first author Michael Minett and colleagues generated additional knockout strains to probe the role of Nav1.7 in a larger population of sensory neurons, and in sympathetic neurons. In one strain, the investigators targeted Cre recombinase-catalyzed Nav1.7 deletion to sensory neurons using the promoter of the actin-binding protein Advillin. They confirmed expression of Advillin-driven Cre in all dorsal root ganglion (DRG) neurons in the transgenic mice, supporting the idea that the knockouts affect all sensory neurons. In the other strain, channel deletion was targeted using the promoter of the signaling protein Wnt1, which drives expression in the precursors of sensory and sympathetic neurons. After confirming loss of SCN9A mRNA in either DRG neurons (Advillin mice) or DRG and sympathetic cervical ganglia neurons (Wnt1 mice), the researchers extensively characterized both strains for acute and inflammatory pain responses, and for neuropathic pain after spinal nerve transection. Unexpectedly, deleting Nav1.7 in all sensory neurons did not render the animals insensitive to pain. The Advillin mice remained responsive to some types of painful heat or cold, and developed neuropathic pain similar to their wild-type littermates. 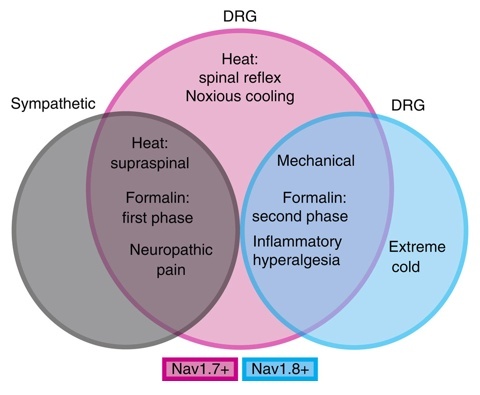 However, deleting Nav1.7 in both sympathetic and sensory neurons abolished the remaining responses to painful heat and nerve injury. The mice were still not completely pain free: Both strains retained their ability to respond to extreme cold, which appeared to require Nav1.8 rather than Nav1.7. The idea that the autonomic nervous system—better known for mounting “fight or flight” responses to stress—contributes to neuropathic pain is not new. “There is a lot of literature from the ’70s, ’80s, and ’90s saying that sympathetic neurons are very important in neuropathic pain,” Wood told PRF. Sympathetic sprouting into the DRG, and interaction between sympathetic and sensory neurons, have been documented in rodent models of chronic pain (for a recent example, see Xie et al., 2011), including the spinal nerve transection model used for the current study. Interest in the sympathetic nervous system died down, however, when sympathetic nerve blocks proved to be generally ineffective to control pain in human studies. The new findings raise the possibility that it may be necessary to block both sympathetic and sensory nerves to relieve pain, and could serve to refocus attention on sensory-sympathetic interactions in neuropathic pain, Wood said. A novel role for Nav1.7 in the central nervous system? Nav1.7’s role in neurotransmitter release is intriguing, said Dib-Hajj. The mechanism by which Nav1.7 affects synaptic signaling, however, remains to be determined. “Nav1.7 in central termini may be important to keep the action potential strong enough to induce release of neurotransmitters,” he told PRF. Wood, on the other hand, said Nav1.7 may contribute to synaptic signaling directly, because electrical stimulation of nerve trunks evokes action potentials in all neurons. He said his group is looking to see whether Nav1.7 associates with calcium channels that control neurotransmitter release. Since the discovery of Nav1.7’s role in CIP and additional diseases involving gain-of-function mutations such as erythromelalgia and paroxysmal extreme pain disorder, the channel has been the target of much drug discovery activity, and some compounds have reached early-phase clinical testing for neuropathic pain conditions (see PRF related news story). The new knockouts offer researchers a model for exploring the contribution of Nav1.7 to neuropathic and other forms of pain, and should help efforts to develop Nav1.7 blockers for pain treatment. Top image: Staining of Advillin-Cre–positive DRG neurons. Credit for both images: Minett et al., 2012, Nature Communications, distributed under a Creative Commons license. It is interesting that, in human patients with CIP due to loss of functional Nav1.7, there are apparently no overt signs of sympathetic dysfunction. Yet in this study sympathetic-dependent neuropathic pain in the spared nerve ligation model is lost in the Nav1.7Wnt1mice. In the case of human gain-of-function mutations of Nav1.7 that cause depolarization of sensory and sympathetic neurons, it has been proposed that the different effects on sensory neurons (increased excitability) vs. sympathetic neurons (hypoexcitability) are due to presence and absence, respectively, of Nav1.8. Because Nav1.8 is not as easily inactivated by the depolarization, it remains functional in the depolarized sensory neurons. The sympathetic neurons, in contrast, co-express Nav1.3 and Nav1.6 but not Nav1.8, and because these co-expressed channels are more readily inactivated, sympathetic neurons should have a hypoexcitable phenotype in the presence of depolarizing Nav1.7 gain-of-function mutations. In loss-of-function Nav1.7 mutations, these co-expressed channels may also generally compensate for the lack of Nav1.7 in sympathetic neurons, accounting for the lack of overt autonomic dysfunction in CIP patients or the Nav1.7Wnt1mice. But apparently Nav1.7 cannot be replaced by Nav1.3 or Nav1.6 in mediating sympathetic effects on neuropathic pain, as shown in this paper. An interesting possibility is that this is because Nav1.7 is concentrated in the tips of sprouting sympathetic neurons and required for release of neurotransmitter from these endings. This is suggested by studies showing the localization of Nav1.7 in the tips of neurites of sensory neurons and PC12 cells growing in cultureand the data in this paper showing the special role of Nav1.7 in sensory neuron terminals’ substance P release. As noted in the discussion section, highly localized functional interactions between sympathetic sprouts that surround sensory neuron cell bodies have been shown in mice in which sympathetic sprouting is induced by the same model as used in this study, as well as in rat sensory neurons using the same modelor the sciatic nerve transection model . Perhaps it is in these sprouting fibers that sympathetic Nav1.7 channels play their unique role. The spinal nerve ligation model used in this paper has pain behaviors with a well-established sympathetic dependence, and is commonly used to study sympathetic sprouting into the DRG. Some other neuropathic pain models show less (or more slowly developing) sympathetic dependence and sprouting; in particular, more distal injuries or injuries with less inflammation may be less effective at stimulating sprouting into the DRG. It would be interesting to use the mice developed in this study to examine the role of Nav1.7 in other models of neuropathic pain. There is really very little information about this topic. The paper cited in this study [their ref. 28] used two other models, chemotherapy-induced pain and the chronic sciatic nerve constriction model. However, the drug shown to reduce chronic pain in those models, tocainide, was shown only to give use-dependent block of Nav1.7 and Nav1.4. There is no mention in this study that the drug’s effect on any other isoforms was examined, so the specific role of Nav1.7 in these models is still an open question. 1. Dib-Hajj SD, Cummins TR, Black JA, and Waxman SG: From genes to pain: Na v 1.7 and human pain disorders. Trends Neurosci 2007, 30:555-563. 2. Toledo-Aral JJ, Moss BL, He ZJ, Koszowski AG, Whisenand T, Levinson SR, Wolf JJ, Silos-Santiago I, Halegoua S, and Mandel G: Identification of PN1, a predominant voltage-dependent sodium channel expressed principally in peripheral neurons. Proc Natl Acad Sci U S A 1997, 94:1527-1532. 3. Xie W, Strong JA, Mao J, and Zhang JM: Highly localized interactions between sensory neurons and sprouting sympathetic fibers observed in a transgenic tyrosine hydroxylase reporter mouse. Mol Pain 2011, 7:53. 4. Xie W, Strong JA, and Zhang JM: Increased excitability and spontaneous activity of rat sensory neurons following in vitro stimulation of sympathetic fiber sprouts in the isolated dorsal root ganglion. Pain 2010, 151:447-459. 5. Xie W, Strong JA, Li H, and Zhang J-M: Sympathetic sprouting near sensory neurons after nerve injury occurs preferentially on spontaneously active cells and is reduced by early nerve block. J Neurophysiol 2007, 97:492-502. 6. Ramer MS, and Bisby MA: Differences in sympathetic innervation of mouse DRG following proximal or distal nerve lesions. Exp Neurol 1998, 152:197-207.